Some people have asked about my decision to travel with only a carry-on on this tour. So far, it’s going great. It helps that I am not terribly fussy about my clothes. I’m wearing dri-fit yoga pants on the tour, with a dryfit black tee-shirt topped by a shirt which is, I hope, more or less presentable. I wear my running shoes on the plane because they are bulky, and switch to my custom Converse for tour events. This is everything. My clothes are in the packing cubes. The black thing front left is a portable nebulizer – can’t go anywhere without that. I have to put that, the iPad, my toiletries and meds and shoes in the buckets at airport security screenings. They ALWAYS pull out the nebulizer for a special going-over. Not sure why. I also have water bottle, belt, and hat for running. I have the chance a couple times on tour to get my laundry done. The reason I am wearing mostly dri-fit stuff is that I can wash and dry it quickly in between official laundry visits. Which might be too much information. But a number of you have written and asked. This week I’ll be in the mountains of NY and VT, and in Boston. I head for NYC next weekend. And pretty much the entire country after that. Monday night in Glens Fall, NY. Tuesday in Lake Placid, NY. Wednesday in Burlington, VT, at The Flying Pig! Thursday at the Brookline, MA Library. and Friday in Wellesley, MA. You are a champ, girl! I always check luggage. For five weeks, I check two. Plus my carryon laptop bag. I wish that you could come to VA! Reading Catalyst and then on to Forged, which came in the mail last week! That’s impressive. I now can’t decide if it’s more or (ever-so-slightly) less impressive than the amount (carry-on size wheelie) of clothes Marian Call took with her on her summer 50-state car tour. I am very, very impressed by your packing abilities. I really need to take a leaf out of your book and start packing lighter when I travel. You are going to the Flying Pig bookstore this week! Very exciting – I love that bookstore. I was there in August. They had a sign advertising your upcoming visit, and I was so jealous that I was going to miss it! (I live 6 hours away – in Canada.) Have a wonderful time, and enjoy the rest of your tour! Now I’m inspired – I think I pack more for a 5 hour trip, forget 5 weeks. I even enlarged your photo so I could study the details. Hope you enjoy the tour! Brilliant! I’m copying you. Except for the purse thing. This has nothing to do with travel or packing but I am so gob-smacked that I have to tell you. I just finished Forge this morning and was blown away. I’ve been an ardent fan since Fever but this book: amazing! I loved it, loved the characters, am astounded by your research, and envy your way with a word. Not only do you have good politics and chickens and a bookselling daughter, you are an amazing talent and I salute you. You’re going to be at the Flying Pig?! If Wednesday will be kind to me and let me spend most of the day at home revising, I will take a break and see you there. 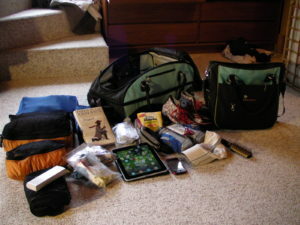 I love, love, love my packing cubes! I am glad to see I am not the only one who tries to carry it all on. Have fun on the rest of your tour. We can’t wait to see you back home in Oswego! You rock! For awhile we tried doing 2 weeks in Europe with just carryon for the two of us and fanny packs. We actually thought at one time we might be able to get down to just the fanny packs ;-p. No more! I have too much junk. You are much more disciplined than I when it comes to packing. I overpack every time. I’m so looking forward to meeting you this week in Massachusetts! 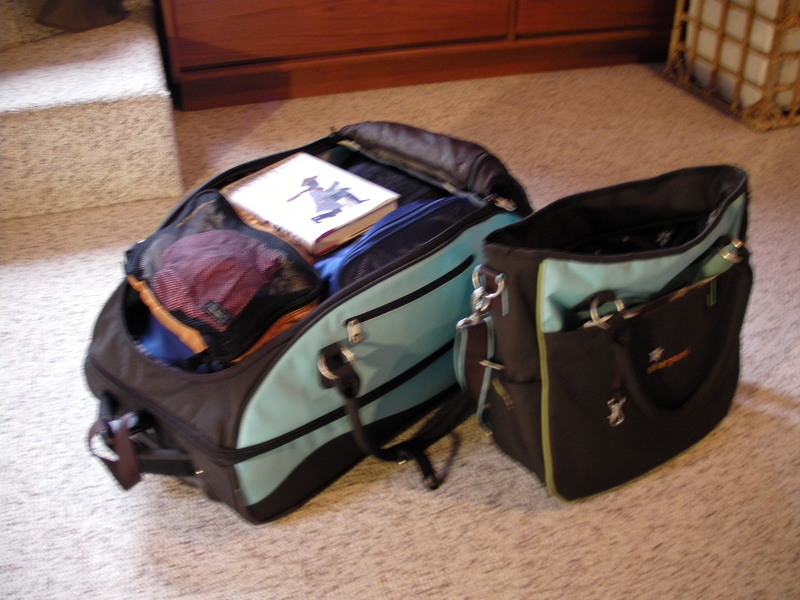 I admire your packing skills – I am yet to establish the art of travelling light when going on holiday, though have recently purchased a bag just big enough to hold nothing more a notebook, a pen, a reading book and my phone. I guess that’s a start! I await Forge’s release in the UK with impatience and wish wish WISH it could be possible to teleport myself to one of your talks. Wishing you all the very best with your book tour and long live the carry-on! THAT IS INSANE!! Can you teach me how to pack? Enjoyed your talk yesterday in Wellesley. Can’t wait for your next YA book, even if you won’t tell us what it’s about. I love your configuration! Packing light is kind of like putting together a puzzle: tricky but satisfying. It was wonderful meeting you in Glens Falls. I hope all’s going well for you on the road. Hello! This is Sam! I obsereved your presentsation this morning at Newtown Elementary! You are an awe inspiring, passionate author! Just the way you get your hands dirty, and plow through those fat history books is questionable! How do you have time for all of this?! Well, I was deeply gratified to have been in your presence, and even recieve a kind hug, and some memorable advice that I have since burned into my memory. I thank you for all that you’ve done for me. You have impacted my life in more ways than I can describe! I am starstruck by you! This is really wonderful Laurie. I thought being a writer was comfortable. But you bring it to a whole new level. I listened to your interview on Blog Talk Radio on Tuesday and you are truly an inspiration! I did sign up for your newsletter. I love your books, but ‘Chains’ and ‘Forge’ were the best. When will ‘Ashes’ come out? My son bought a nook because we are runneth over buy books – Will you be putting more of you work there? What do you think of the e-books? Not tangible or my preference but definately a space saver. We Love your writing style/s – the vet series and hisorical fiction are all we’ve read so far – You have a great wing span! Thank you Thank you Thank you!!! Next PostNext At the Halfway Mark! !